We’ve been doing some more work on our intranet. Here's a rundown of our latest release and some final thoughts on what I've learnt working on this product. Why take a digital approach to an intranet? I’ve said in previous posts that intranets can be the scorn of digital purists. "Why not just have a wiki and a blog - it’s totally free?” they cry. Well, maybe. But as this is my last intranet sprint (sprintranet?) 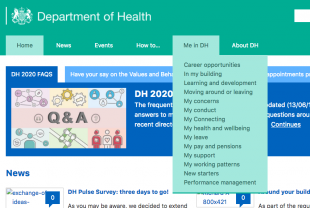 I wanted to make the case for taking a digital approach to this ever present departmental tool. I think there are 4 compelling reasons. Improved experience for users. The obvious one. Civil servants are users too, and saving them time and effort with products that work is better for them, and better for taxpayers. It’s a means of spreading digital culture and techniques widely across the department. Talking to lots of teams in the department about their intranet content or involving them in user research has enabled me to introduce principles of agile and user-centred design to lots of people who otherwise would never have encountered these techniques. A good thing in the wider scheme of digital transformation. Getting content design more widely understood. 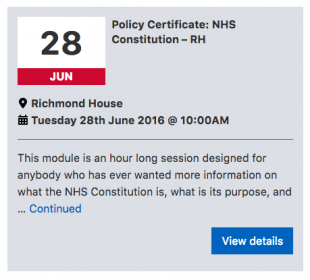 I'm increasingly convinced that content design training should join information security and unconscious bias as mandatory for policy civil servants. Until that happens, working with teams on their intranet content is a decent alternative. It’s a good training ground. A staff intranet is a reasonably low stakes environment, which makes it ideal for practising agile techniques, user testing and the like. Particularly as uses are on your door step. Four different fast streamers have now participated in running guerrilla testing or pop up labs in the department, and done brilliantly at it. On to the highlights of our latest release. As ever, if anyone is interested in playing around with the intranet WordPress theme, it’s available on Github. All comments and thoughts welcomed. In our last intranet post we talked about the changes to the homepage design. The changes have attracted a lot of great comments. But more importantly our ongoing testing is showing users are completing popular tasks more easily. Of course not everything is working perfectly, so we are continuing to tweak and improve. For instance we found users were not noticing when new content was being posted in the campaign box. So we introduced a ‘new’ banner to signal this event. Our ongoing user research has repeatedly surfaced pain points for users navigating the site. Users did not always understand the main section headings, or what topics might be listed underneath. To test further we ran several card sorting sessions to try and come up with better labels and a more intuitive architecture. Despite plenty of hard work, it turned out we couldn’t. Naming and sorting things into categories is just one of those timeless problems. We ended up agreeing that what we had was probably the least worst option. To attack the problem from another angle we introduced some new functionality. We implemented the brilliantly named Accessible Mega Menu. 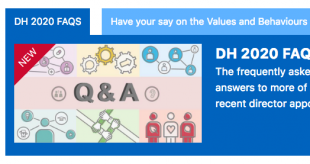 This now provides a drop down of topics that appears underneath a section heading, to help users see what is available and help them answer their questions more quickly. The department puts on a wide range of events. By making use of the Eventbrite API, our intranet administrators are able to create and manage events using all the functionality of Eventbrite. Once published, the event details are pulled automatically into the relevant intranet pages. Along with some design tweaks, we’ve made an already excellent events booking process even better. Our next sprint will be later in the year. Look out for further updates from a new product manager then. And a final word of good luck and thanks to the brilliant team. My laptop will continue to wear our mission patch with pride.